One of my goals for December was to work through the stack of recipes I’ve been collecting. Part of the reason for this goal was the fact that I’ve collected an insane amount of recipes and need to work through them to decide if they are keepers or not. The other reason is that the dead of winter is a great time to spend time in a warm kitchen. Here is the first recipe I tried from my collection. 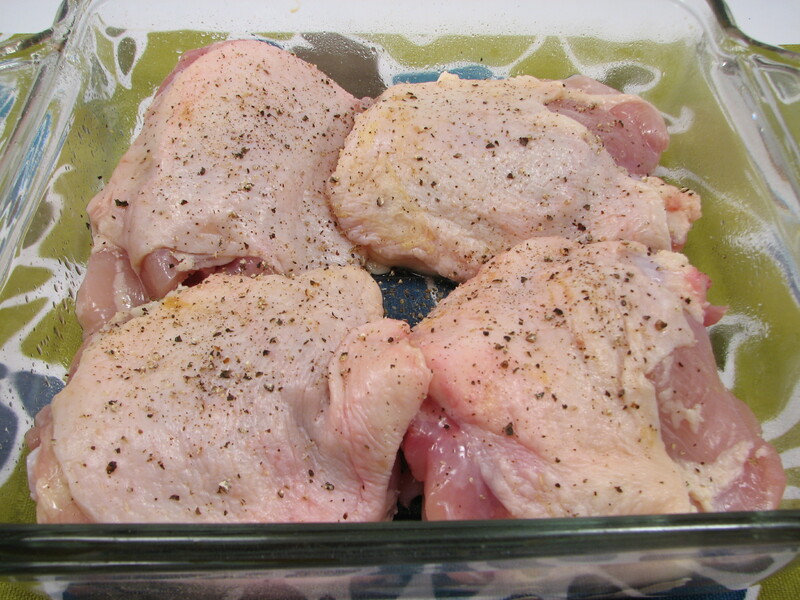 Trim the excess skin and fat from each chicken thigh. I leave just enough skin to cover the meat. 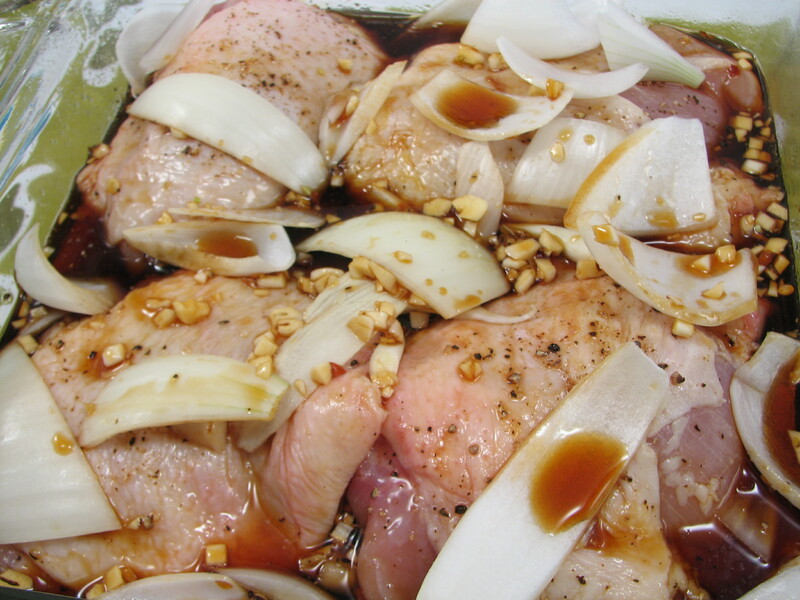 Place the breasts in a baking dish just big enough to accomodate the chicken. If you have too much space between the pieces the sugars in the sauce will burn and your evening’s entertainment will consist of dish scrubbing. 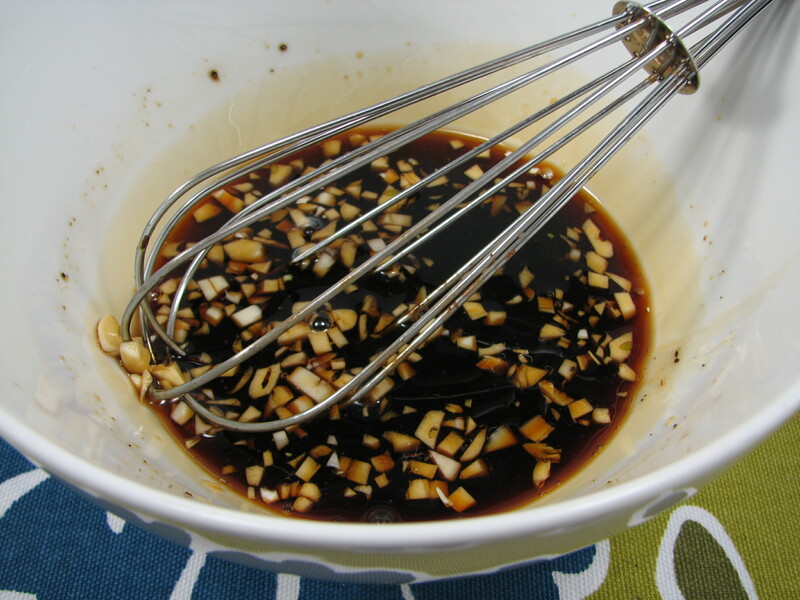 Whisk together the soy sauce, honey, onion, garlic, and pepper*. Pour the sauce over the chicken. Turn each piece so it is well coated and then leave it skin side up. Bake at 350°F for 30 – 40 minutes. *If you aren’t cooking for sensitive palates (ie young kids or picky spouses) consider substituting crushed red pepper flakes for the black pepper. These will add a nice kick. First, this recipe was super simple. I had all the ingredients on hand and there weren’t that many ingredients needed. Not only that, it barely took anytime to make this recipe. 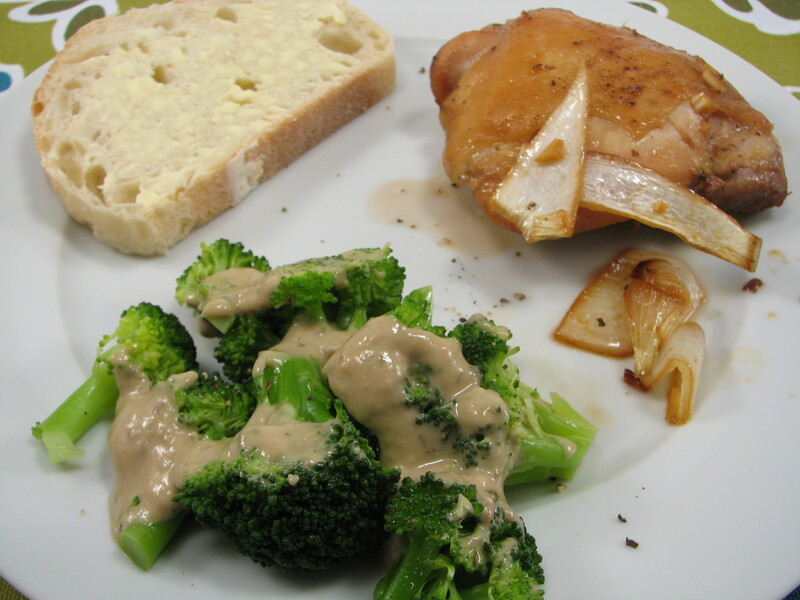 I think this a good recipe for a weeknight dinner when there’s not much time after work. I changed the recipe a tad, I used a little less of everything because I was only cooking 4 chicken thighs instead of 6-8. I added a little red pepper flakes to the mixture but not much because it was the first time I was making it. I’d add a bit more next time. I also didn’t use a lot of onion. I wanted to use up what I already had chopped up instead of cutting a new onion. I wish I had cut more onion. I had some time to kill, so Michael and I got caught up on some Dexter! I baked the chicken for about 35 minutes before I flipped them over. I cooked them for another 8 minutes or so while I got the rest of dinner cooking. The house smelled delicious while the chicken was cooking. I couldn’t wait to try the finished product. I steamed some broccoli to go with dinner. The final verdict: this recipe is a winner. I loved it. 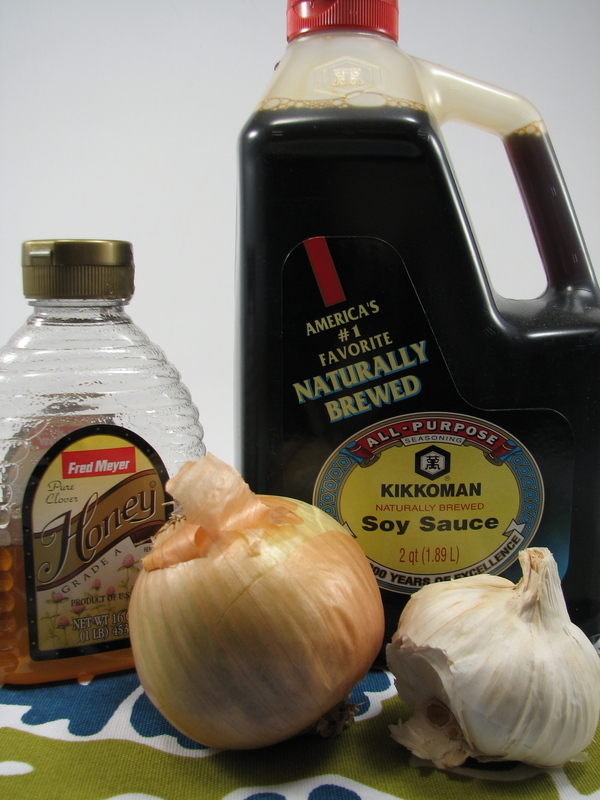 The flavor wasn’t overpowering–I was a tad worried it would have too much soy flavor, or too much sweetness from the honey but it was just right. 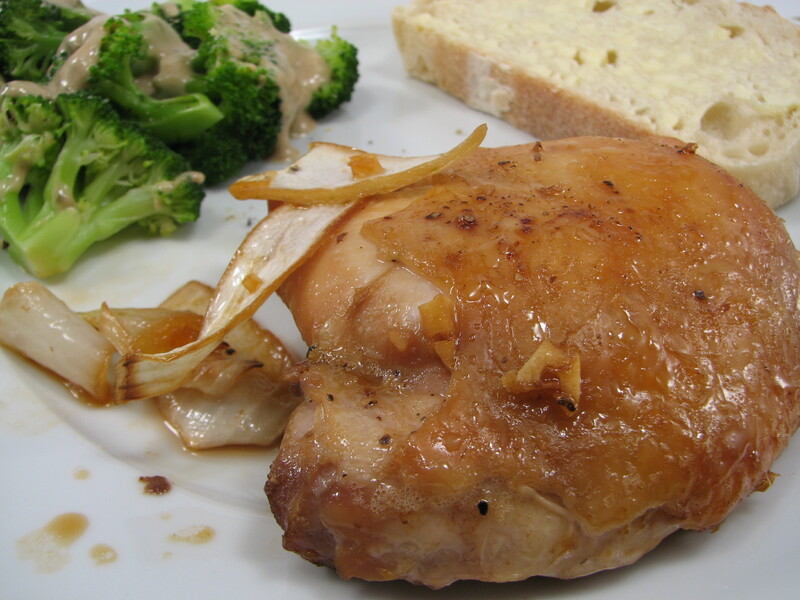 The chicken was perfectly cooked, juicy and delicious. I do wish I’d added more onion to the recipe. Next time for sure. 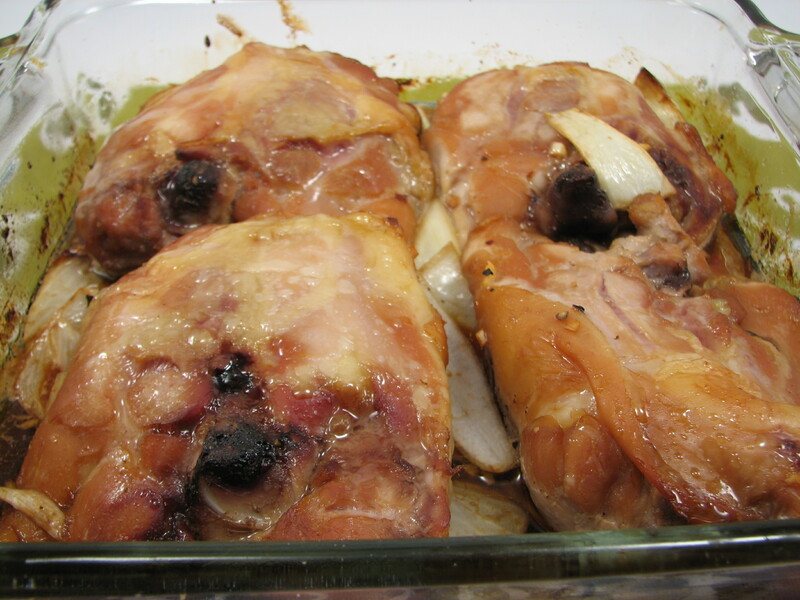 I calculated the calories in the recipe and it came out a little higher than normal but that number includes two chicken thighs (and we just ate one each so it will be less). 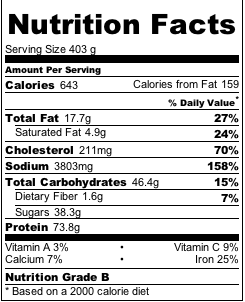 So estimating this recipe, one chicken thigh is in the 300 calorie range. Not bad. Great recipe! QUESTION: What’s your favorite chicken recipe?